Starting on Monday January 9th we will begin a fasting initiative. The initiative is being coined The Forty-Day Challenge. It will be a time of fasting for spiritual power. 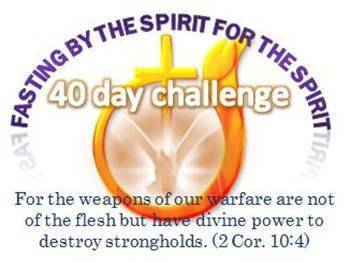 The Forty-Day Challenge comes from the book of Luke chapter 4. Jesus was led into the wilderness by the Spirit. While in the wilderness, he went fasting for forty days. After the forty days, Satan came to Jesus and tempted Him with three different tests. The first temptation was with bread to counter his hunger. But Jesus replied to the tempter that man should live by every word of God and not just bread to eat. Studying scripture is a necessary part of any fasting initiative. Fasting opens up the mind and heart to receive the Word of God more clearly. It empties oneself of everything else that satisfies in order to be filled with that which is eternally rewarding. Fasting gave Jesus power in the Word to overcome the lust of the flesh. Satan secondly, came to Jesus with an opportunity to be worshipped and glorified by the entire earth, as He was offered the authority and glory of it all. His reply to the Prince of the power of the air was that man should worship the Lord God Only. Fasting should increase our desire and passion for God, taking our eyes off ourselves and focusing our attention on Him. Realizing that it is not about us and all about Him. Fame, fortune, and fatness is what our human nature lusts after. Only in denying the infatuation for these fleshly laurels can one break the stronghold of them. The lust of the eyes is a powerful adversary but in fasting Jesus overcame. Thirdly, the devil challenged Jesus in His relationship with the Father and all of Heaven. He was tempted to pray and call upon the angels to perform supernatural feats of divine protection. Throughout the forty days, Christ had no doubt spent many hours in prayerful communication with the Father. And although, Christ knew that the Word did decree for his protection; He also knew, that everything lawful to Him may not necessarily be profitable (see 1 Cor. 6:12). This revelatory knowledge came from interaction with ‘Abba Father’. Dr. Raymond Culpepper, General Overseer of the Church of God Cleveland TN, once wrote “prayer is more than communicating with the Father, it is interacting with Him.” One cannot interact with God and be full of pride; but in prayer the pride of life is dissolved. Christ’s interaction with His Father during fasting was far greater than interaction with all of heaven in time of testing. After the forty days of fasting in the wilderness and following the time of testing with the devil, the scripture declares that Jesus came out “in the POWER of the SPIRIT” (Luke 4:14 Emphasis Mine). Fasting by the Spirit for the Spirit; this is what Jesus did to overcome the enemy and it is what the church must do to overcome in the new year. Fasting is a spiritual weapon in God’s holy arsenal. Apostle Paul wrote: “for the weapons of our warfare are not of the flesh but have divine power to destroy strongholds.” (2 Cor. 10:4) This forty day challenge is a dare to the church of this generation to hunger, deny, and sacrifice in order to march onward into 2012 with greater spiritual power. Those who accept this forty day challenge will find with it, the keys to walking in the power and anointing that sets captives free and brings healing, wholeness and restoration to the nations (see Luke 4:18-19). Coming Soon will be a devotional booklet for a guide throughout the forty days. I have to convey my appreciation for your kindness supporting people who really want help on this important content. Your very own commitment to getting the solution around appears to be amazingly beneficial and have surely allowed guys and women just like me to reach their objectives. The insightful guide can mean a whole lot to me and especially to my fellow workers. Best wishes; from everyone of us. I’m ttying to find a theme or plugin thhat might be able to resolve ths problem. If you have aany recommendations, plerase share. Previous PostPrevious Raising Up A Mighty Army!